A filled tag is the result of planning, preparation, and patience. Getting ready to hunt starts long before opening day. With our busy schedules, work, family, and life we all must get organized. Make a List Keep a chart on the wall in your Man Cave or hunt staging area. Write down what you need. 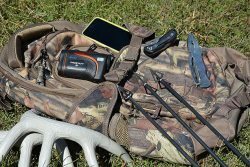 “License, gun, knife, boots, socks, range finder, binocs… You do not want to discover what you forget once you are afield. Communicate Talk with your companions. Who is driving, meals, drinks, extra gear… Conversation brings up ideas and helps to plan the trip. Know your job If you oversee the trailer, have it ready. Maybe it is just the gear hauler and has room for game. Make sure the wheels, hubs, hitch, lights, and unit are road worthy. Is the tag in place? Do you have straps, or a tarp to tie everything down? Pack ahead of time Have an area where you can lay out your gear. Display it so you can visually check it. Ammo, pack, etc. Don’t assume everything is ready, confirm it. Every time you inspect the display, you will remember another item. Tub it up Have a sealable tub to keep your gear intact. Make sure the lid will secure snuggly, your tub may end up in the open trailer. The tub will also eliminate any scents from gas, smoking, or smelly friends. Years ago, I went on an elk bow hunt. My bow was in the hard case, so surely my quiver, release, arrows, and guard were in there too. We arrived at the hunting site and when I opened my case, no quiver, release, or arrows. Stuck in the foam holders were two old, used hunting shafts. I was able to shoot with fingers, so I did not need a sight or release. Hunters must concentrate on the hunt. We can’t be making excuses, worrying about this or that. We need to be on target with as few distractions as possible. Get ready ahead of the hunt and enjoy the day.